This story is a re-telling of the best-selling contemporary romance The Education of Caroline, now told from US Marine Sebastian Hunter’s point of view. 18+ only due to scenes of a sexual nature, and violence. I fell in love with Sebastian and Caroline from the very beginning and when I saw that this was Sebastian's point of view, I knew I had to read it and I loved it. This story starts ten years after Sebastian last saw Caro and they meet again. He is full of anger and he wants to hate her but the love he feels outweighs the hate. So what does he do? He tries to learn the truth of why she never contacted him after they were forced apart. Because for him, Caro was and will always be his once in a lifetime love. There will never be another and no one will ever take her place. And Caro feels the same way. This side lets you into the pain and guilt the Sebastian feels and what he goes through that we didn't get from her point of view. Can they pick up where things left off ten years ago or will Sebastian push too fast and drive her away? Will the threat of war, separation and possible loss of life be the end of their story? I highly recommend you read The Education of Sebastian and The Education of Caroline as they are in her point of view, although you could read this as a standalone. I love Jane Harvey-Berrick and thank her for writing this series and need to read more from her. I was born on the 13th, which explains a lot. I write every day and get twitchy on the days when I’m prevented from writing. I live by the beach, so you’ll find a beach scene in all of my books sooner or later. Hobbies include ogling hot surfers. Writing is solitary but that doesn’t make it lonely. My FB and Goodreads friends are very important to me. My writing buddies are A. Meredith Walters and Devon Hartford—lovely, kind, generous people. I carry a notebook EVERYWHERE. I never know when ideas will come to me. I even write notes to myself at night in the dark. Hopefully I can read the scrawl I’ve written in the morning. There’s a little part of me in every book I write. The philosophy from ‘Playing in the Rain’ is that you have to make the most of the life you’re given—choose to be happy as much as you can and look for the positive. I don’t always make it, but I do try. 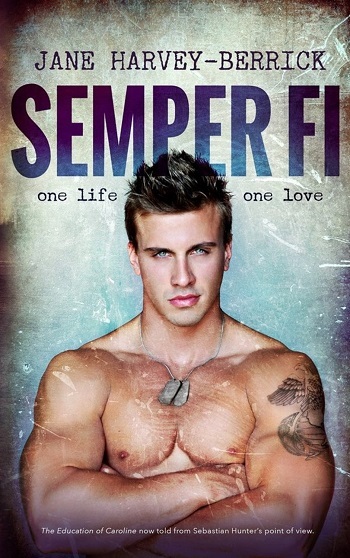 Mary reviewed her personal copy of Semper Fi (The Education of... #3) by Jane Harvey-Berrick for this post.